I’ve got a list of favourite authors and I collect cookbooks. I have stopped counting my cookbooks since I started this blog because, considering the size of my flat, I’ve got an obscene amount. At least in my opinion, it’s obscene, considering the storage limitations. My next project is to source a book case that can hold my burgeoning cookbook collection! I do, however, want this book. It’s supposed to be released on Thursday, 27 September. And it’s already creating quite the ruckus. 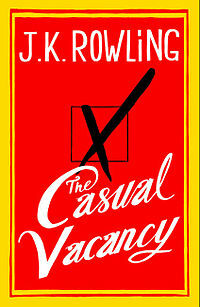 It’s J.K. Rowling’s next book, aimed at grown up readers. The tagline they’re using to promote it is “A big novel about a small town.” I should have pre-ordered my book, but things have been hectic and I didn’t get around to doing anything about securing my copy. The Kindle edition is more expensive than the hardcopy. But really, I am a J.K. Rowling fan. I think I’m more than likely to get the actual book! Previous PostWhat’s in my handbag?